Camlorn is a major city of High Rock, located on its western coast. The city was previously the center of a kingdom, also called Camlorn, which was founded in 2E 302. It was once predominately a Nordic city, but was assimilated by the Bretons over time. In 2E 541, the city was sacked by a horde of Reachmen led by Durcorach the Black Drake. After the Reachmen were defeated, Camlorn, along with Daggerfall, Shornhelm, Evermore, and Wayrest, signed the first Daggerfall Covenant. In 2E 582, Camlorn was ruled by Duke Sebastien. During that year, the city was badly damaged by Faolchu the Reborn and his werewolf army. They were defeated by Daggerfall Covenant forces and the Soulless One soon afterwards, and the city was eventually rebuilt. 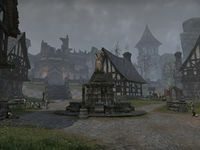 In 3E 63, the Prince Pelagius, who would go on to become Pelagius Septim II, visited the city of Camlorn to woo the daughter of King Vulstaed, Quintilla, regarded as the most beauteous princess in Tamriel. She would later go on to become his second wife. Some time just prior to 3E 432, Kelmena, the daughter of Duke Senhyn of Camlorn, was married to Prince Camaron of Daggerfall, suggesting a possible unified kingdom along the western coast of Tamriel. Camlorn's flag during the Battle of Granden Tor. This page was last modified on 6 January 2019, at 20:33.